Today, Einstein is famous for his discoveries about space and time that changed the way we see the world. But in his day, he was also famous for humanitarian passions that interacted in intriguing ways with his scientific imagination. 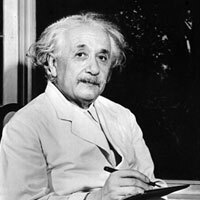 Delve into Einstein's Jewish identity and his passionate engagement around issues of war and race. Examine Einstein's way of thinking about mystery, eternity, and the mind of God through Einstein's own words and analysis from current leaders in science. Interview: What is String Theory? Dyson reflects on Einstein's words, as well as his own approach to issues of time, mortality, and death.